Welcome to the second week of the Think Outside the Toy Box Summer Fun Series! 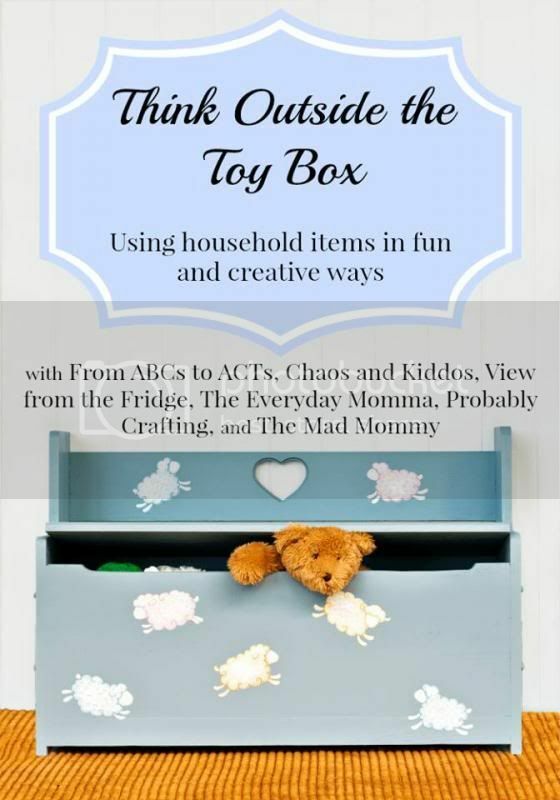 If you are here for the first time, you can check out the introduction to the Think Outside the Toy Box post for all the details of this awesome new series. Last week in this series I introduced you all to glow-in-the-dark bowling. Now that would have worked great for this week as well. However, I already had my mind completely set on an idea when I saw plastic bottles on the items list for this series. I knew immediately what I was going to do with them and I was super excited. I have been looking forward to trying this project out ever since I pinned this image months back onto my DIY Myles board. To be honest, I probably never would have gotten around to doing it if it weren't for this series. So I am loving trying all these project and ideas out with Myles. Unlike last week, so far Myles is loving his plastic bottle waterfall. I'm guessing because it involves water and getting messy. Also he is really intrigued by how the whole thing works; he has been moving the bottles around and sticking his hands in them trying to figure it all out! This has already given us lots of fun playtime in the summer heat! 1. Find an open spot in your wood fence to set up the waterfall. Or you can attach a 4x4 or larger piece of wood to any fence or wall you choose. 2. Take one plastic bottle and cut the whole bottom off of it. Hold the bottle, cap side down, up to the wood to measure where you want the top to be. I had my son stand on the step-stool and reach his hands up. We placed the top bottle where he could comfortably touch the top of it. Use one screw and washer to attach the bottle, cap side down. 3. At this point you can set-up the waterfall however you would like. Because I wanted Myles to be able to reach the top when standing on his step-stool, we weren't able to make ours very tall. After the top bottle, we were only able to fit 3 more bottles. This ended up working out great for us, but if you have older and taller kids, you may want to start higher and use more bottles. For the middle two bottles, we cut rectangle shapes out of the sides of the bottles and attached them to the fence staggered and slightly diagonal so that the water would pour into the next bottle. For the last bottle, Mark came up with the idea to make it so that the water would sprinkle out of the bottom of it. Using the knife, we stabbed one side of the bottle about 8 times. Then we attached the bottle (holes side down and cap still on) to the fence. Also this bottle should be vertically straight. 4. Fill another plastic bottle with water. 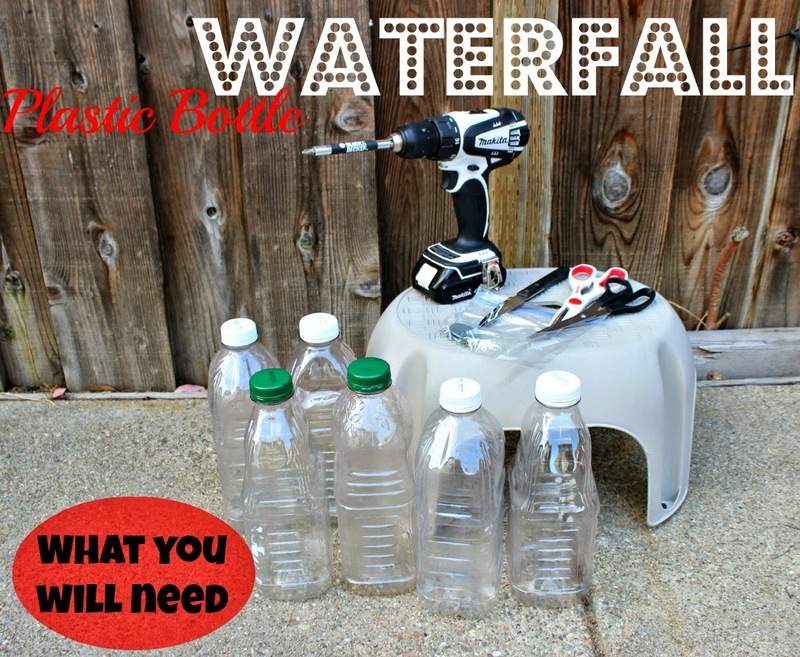 Set it inside the top bottle and let the waterfall fun begin! 5. Repeat, repeat! Get wet, messy and add some rubber ducks to the mix! So there you have it: week two of the Think Outside the Toy Box Summer Fun Series is complete! Also don't forget to check out what all of the other ladies put together for this week's item in the link-up below. And if you have a post (new or old) that you created showcasing plastic pop bottles in a kid's project, craft, game, experiment, etc., submit it below as well. No post this week? No problem; join us next Monday when we will be using paper grocery bags! This is pure awesome! What a fantastic and fun idea! Livvy would this too!! Such fun! That is very cool! 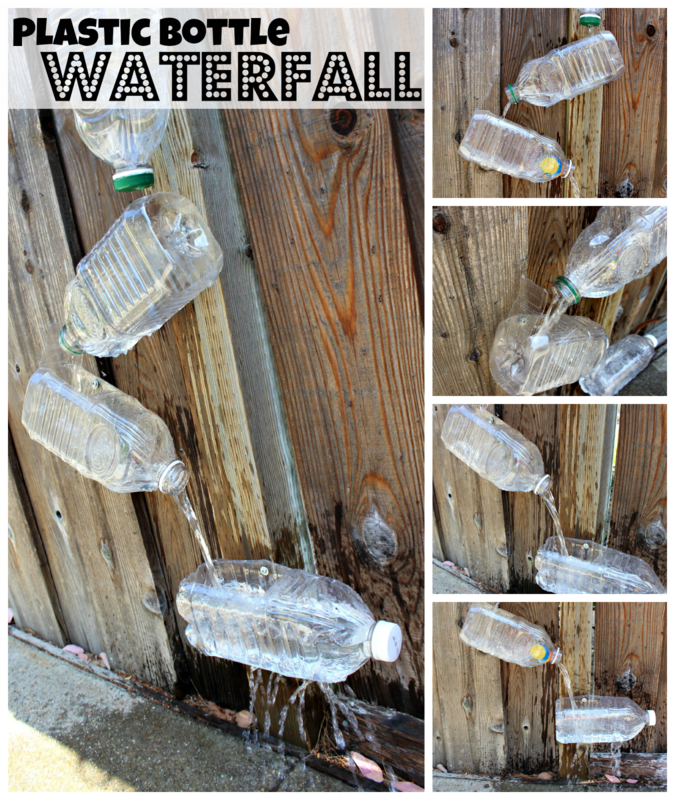 I've always wanted to try a water wall like this, but your step-by-step instructions make it seem possible! Wow what a fun idea! 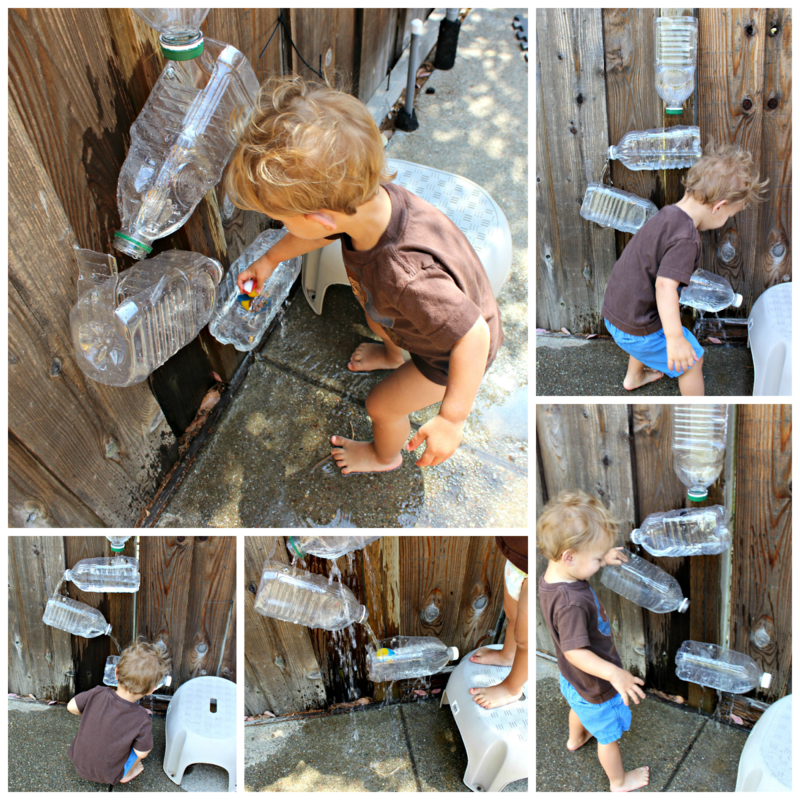 My boys would love it & it would cool them off this summer, I'm going to have to start saving bottles! This one took a little but more time and effort, but it was definitely worth it because Myles loves it and actually played with is and still does (which is a miracle for him)! It would be cool if you could somehow do it in the bathtub too, like attach suction cups to the backs of them. Thanks love! It was actually fun to put together too. Trying to decide and figure out cool ways to to have the water go down was a good time for us. And Myles was all about 'helping' out too. If you have the chance you should definitely try it out! Water is always a big hit! Water is a huge hit here too! Absolutely try this during the summer! Great idea!!! I have thought about this. I bet my daughter would love it! I always pin things with grand ideas of making all these awesome things and then never actually do it. That's why I was really excited about doing this series bc I knew I would finally do some of these things. It has actually been fun so far and luckily my bf helped with this one. He is a bit more handy than I. I will admit he did most of the work it really wasn't hard. I could have done it but it would have just taken longer. It was about 30 mins for the while thing. I would've to see it if you get a chance to try it out! My boyfriend had us start saving those juice bootles and I was getting so annoyed because they were just sitting around. He kept saying we will use them for something; it's worth it. Now I guess he was right... for once.... :) I'm glad we finally found something g to do with them. I'm sure your kids will love it too! Its fun for the adults too! 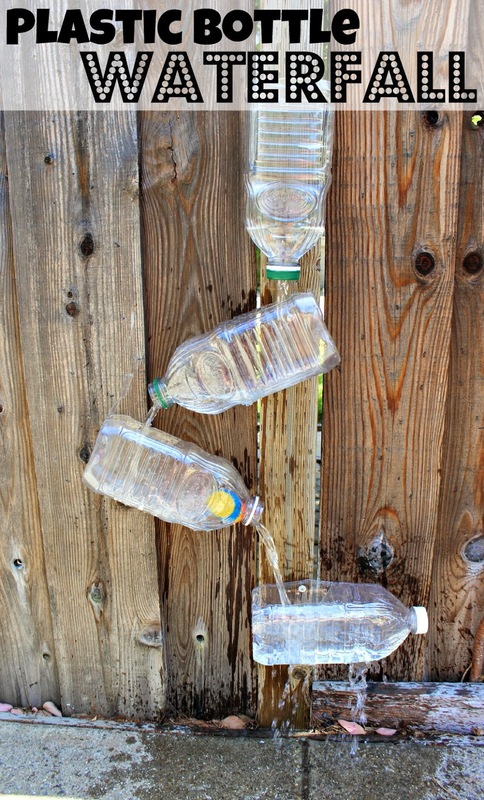 I bet you could get creative with the bottles and make it an actual water feature in your backyard too! It does look pretty cool already but the rubber ducky is throwing off the 'cool' vibe lol. I hope you get a chance to try it, it wasn't as hard as I thought it would be. It really only took us about 30 minutes start to finish. Definitely worth the time though! I didn't get another other comments so they must have already been deleted. Thanks for stopping by and pinning! I would love to link-up, can you send me the link to your blog? This is so great Julia!! I've been thinking about making one of these for Nicholas for so long now and I have just never gotten around to it :) Yours turned out fantastic! Oh I almost shared one of my latest posts where I talk about things we've done on a budget "outside of the toy box" but the linkup is closed. This is a great idea. 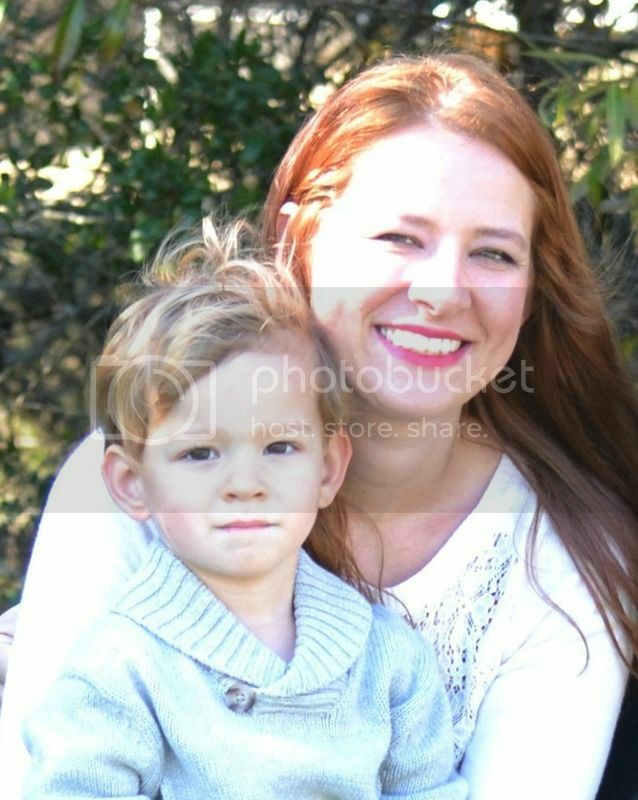 Your son looks so intrigued. I think JR would love it. I pinned for later. Thanks so much for linking up with us at Creative Style linkup! How much fun! My 5 year old would love this! Thanks for dropping in to Cook it! Craft it! Share it! hope to see you back tomorrow! Thanks for stopping by and checking it out! We have had a lot of fun with this one! Totally worth the 30 mins to put together and it made all from thing we already had! OMG yes!!! Anything to keep them occupied! Although it usually only lasts 5 minutes! But something is better than nothing and he plays without having a tantrum so it's a total win!!! Yea I've been wanting to make one for. While too. The first time I was it on Pinterest I thought it looked so awesome! I knew I wanted to try it out when I saw plastic bottles on the list. I had avoided it before bc it seemed a little too complex but it was actually really easy and you can set it up however th want. It was definitely worth the 30 mins! Thanks for including me in on this series! It a weekly link-up through July so definitely come back and link-up when you get a chance! It's something that he really took interest in. He was trying to figure it out at first and then he would just watch the water come down. I think all little boys would love it. You should try it if you get a chance! Love this, but better catch every drop in our drought to reuse! Looks like lots of fun! Featured you on Mom's Library this week! This is an awesome idea. We go over my cousin's house almost everyday and she gives us a bottle (or two) of water. I don't know what to do with them and I HATE throwing them away! I don't have a fence, so I wonder if I can make it "to go". Thanks for sharing with Creative Style! Yes so true! It's easy too because you can just put a container at the bottom as well. Thanks so much for featuring me! I came by and checked it out too! I so appreciate you coming by and sharing my post as well! I was thinking about how you could do it without the fence as well. You could always just use a 2x4 or something of that nature, screw the bottles in and then lean up against somewhere. Or maybe a piece of plywood? It's definitely a fun thing to try! What if u used peg board? U could attach the bottles with nuts, bolts, and washers, even have some more flexibility in how they are positioned. Then, lean the board against the fence or move where ever u like! When u get tired of one configuration, move it around without drilling more holes (as long as plastic holds out). That is an awesome idea. I would have never even thought about that. I like that you could move it around and change it up without making more holes. So clever! ning up all fallen fruit can reduce fruit fly infestations dramatically.